Spring is near and with it brings the anticipation of a beautiful 2014/2015 summer in New Zealand. Shade7 have been very busy over the winter months developing a brand new Riviera cantilever umbrella designed to provide a large amount of sun shade. A new 3.5 metre square version of the Riviera has just been launched, making it the largest size in the Riviera cantilever umbrella range. Offering 12.25m² of shade, the umbrella has been specifically introduced to accommodate larger outdoor spaces. The new Riviera 3.5m square not only looks magnificent but it offers a great amount of flexible shade. Residential and commercial outdoor areas ideally need an adjustable umbrella that can be shifted easily as the sun moves. All umbrellas in the Riviera range can be rotated 360 degrees and locked into 3 tilt positions. Shade7’s original Riviera cantilever umbrella was first launched two years ago after nearly three years of design, engineering and testing. It had been specifically designed in New Zealand for New Zealand weather conditions to endure strong wind, rain and intense sun. Since the release of the Riviera Shade7 have sold thousands of units across New Zealand, Australia, Mauritius, USA, Hong Kong and throughout the Pacific Islands for both residential and commercial sites. 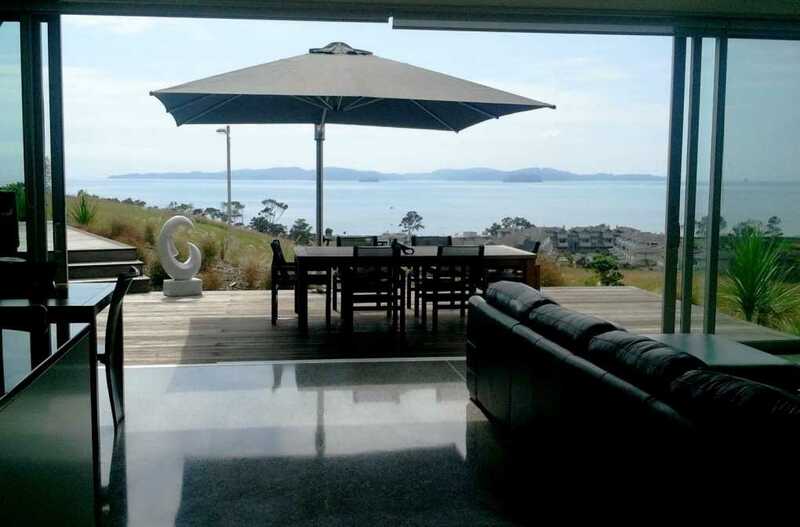 The 3.5m square Riviera cantilever umbrella is available now for viewing at Shade7’s showroom in Auckland. It has been stocked in three standard colours; Charcoal, Black and Ecru. Customers can also order from a very wide range of other stunning colours which can be custom made on request. Shade7 are encouraging customers to purchase umbrellas early in order to maximise their usage over summer.